Selling Colorado and Wyoming ranches and Rocky Mountain recreational property. North American company offering web site development for Guest Ranches, Dude Ranches, Cattle Ranches and Horse Ranches. Ranch breeds Gelbviah cattle. Includes sales and history. Ranches and farms for sale. Brokerage, appraisal, and consulting services. Family-owned and operated Santa Gertrudis cattle ranch located in Mission, Texas. Located in Lloydminster, Canada, raising Hereford and Angus cattle. Includes information on sires and map to the ranch. Boer goats for sale. High quality foundation stock and show prospects. Also deer hunting and live animals. Ranch located in Eldorado, TX, USA. Specializes in large farms, ranches, agriculture businesses, feedlots, and exclusive equine facilities throughout the Midwest and Southwest. Features listings of farms, ranches, rural lands and recreational properties in the western United States. Includes online searches for property, brokers, and water. Offers ranches, farms, hunting, and recreational properties in Montana, the Dakotas, and Wyoming. Features listings and agents. Classified advertising for ranch and rural real estate in every corner of the world, ranches for sale by owner for cattle, horses, exotic animals - properties for everyone. Agribusiness real estate brokerage for sellers and buyers throughout the state of Oregon. Specializing in farms, ranches, dairies, vineyard and equestrian property. Montana company which advises on business/resource planning and implementation for the ranch properties of the Rocky Mountains, with the emphasis on preservation of habitats and properties. Several useful information pages on the site. Agribusiness real estate brokerage for sellers and buyers throughout Oregon and Northern California. Specializing in farms, ranches, dairies, vineyard and equestrian property. Providing equestrian ranches, barns and arenas including project consulting. Features ranches and farm land for sale, agricultural real estate appraisals, ranch property management, and agricultural land loans. Offices in five western US states. Offers insurance for hunting and fishing guides, outfitters, resorts, fishing lodges, RV parks and campgrounds, farms, ranches, stables, dude ranches, and sporting clays. If the business hours of Western United Realty LLC in may vary on holidays like Valentine’s Day, Washington’s Birthday, St. Patrick’s Day, Easter, Easter eve and Mother’s day. We display standard opening hours and price ranges in our profile site. We recommend to check out ranchbrokers.com/ for further information. 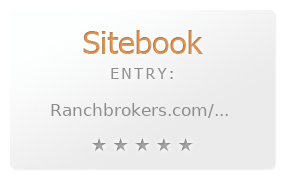 You can also search for Alternatives for ranchbrokers.com/ on our Review Site Sitebook.org All trademarks are the property of their respective owners. If we should delete this entry, please send us a short E-Mail.